at Bosbury Church are (from left) James, Robert and Peter. HEREFORDSHIRE Council is under fire over its running of a trust set up to let ex-soldiers make a living off the land. The allegations are outlined in letters sent to all councillors by the Buchanan Partnership which says it is fighting to restore the legacy of a young county soldier lost to the First World War. That soldier was Alan Buchanan, killed at the Battle of Ypres in June 1915. His legacy is a 750 acre estate at Bosbury, near Ledbury - now worth £9.5 million on the open market - left by his father Robert to provide homes and work for ex-soldiers. The partnership alleges that over the past 12 years, not a single ex-military applicant has been appointed as a beneficiary of the trust and only three of the current nine tenants have ex-military backgrounds, with the council instead accused of awarding charitable tenancies to the farming community and selling off properties and land to bank more than £1 million. The council says it is working with the Charity Commission to modernise the way the trust operates and widen its membership to better meet the demands of ex-servicemen. 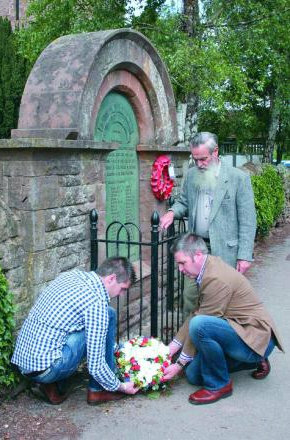 Robert’s grandson Peter and his family have laid a wreath at the Bosbury war memorial to mark Alan’s death and draw attention to the allegations. The Buchanan Partnership was set up by the family to restore the trust to its original purposes. They claim that the “small print” of the trustees’ estate management policy deters exmilitary applicants from applying because of discriminatory policies introduced by the council, including a requirement for an applicant to have £100,000 “without undue recourse to borrowing” before being considered for a subsidised tenancy. The partnership says that since 1998, when Herefordshire Council took over the management of the trust, seven properties and 56 acres ave been sold off and not been replaced with vacant tenancies being filled with private lettings or re-let to existing commercial tenants. County MEP Mike Nattrass says the allegations made against the council are enough to “raise noises from the grave”. “This is a trust and I hope not just a game of Monopoly with someone else’s land,” he said. In a statement the council said that - as the trustee - it was about to enter a “consultation process” with all parties having an interest in the charity to put its plans in the public domain. Note: A statement in the form of a ‘Frequently Asked Questions’ was published by Hereford Council in December 2015. This may be downloaded here.